Note: May 2016 I find the chuck will not hold a drill bit smaller than 2mm. The Radial Arm Drill (RAD) appears to be a generic model from PRC or Taiwan, then branded to suit resellers. It looks similar to any other brand I saw but Carba Tech was the only AUST supplier of this entry model. Although it is specifically designed for entry level wood work there is no reason it cannot be used for metalworking. I did not have a suitable drill press apart from my portable drill attachment which I have had for years. It had a distance limitation from the rear post to the chuck position of only about 120mm depth, then add a table jig and it was almost impossible to use so I needed to purchase one with more distance. The RAD gave me 130mm to 420mm more then I would ever need. The machine came partly pre assembled and required the assembly of the post or column and base then the fitment of the radial arm mech to the top. My first impressions of the drill were that it was a huge improvement on what I had. The operation manual was of surprisingly good quality and had very clear graphic images to assist the operator. The machine was able to be set up without any problems however a work bench would be essential to assist the assembly due to the weight and size of it. As the machine had so many features the operation of the machine is quite complicated compared to a standard drill press. This means with the added features some additional care needs to be taken when using it if repeatability and accuracy is to be maintained and produce satisfactory results. The accuracy and repeatability is as good as you could set it up however you cannot use the drill to produce a series of holes along a prescribed line simply by operating the head traverse knob and simply drilling, there is too much movement in the radial arm section to allow this. Considerable checking of the drill position prior to drilling and then again after locking everything up is required to produce accurate repetitive drilling. On the RAD there is the standard quill feed handle, and a table positioning handle, nothing different there. The Head Rotation Lock. This locks the drill at the required drilling position concentric to the column. The Head Angle Lock. This locks the drill at the required angle to the table and, The Head Traverse Lock. This locks the drill at the required position out from the column at the table. All of which must be checked locked and checked again before drilling if accuracy is to be maintained. Head Rotation Lock must be engaged at every drill operation. Great for drilling concentric holes. The Head Angle Lock. This has a 90 deg keyway and a locking guide pin however there is so much movement in the manufacturing tolerances anything from -1 deg to 0 then + 1deg of movement at the head subtend this down to the drill bit tip and there is a huge amount of deflection. The Head Angle Lock must be engaged at every drill operation. With the locking pin disengaged angles from 45 deg L and 90 deg R are possible, again engaging the Angle lock before drilling. As to why you would tilt the head 90 deg instead of just rotating your work is a bit of a mystery. 0 to 89 deg I can understand however the feature is there no doubt somebody has used it! The Head Traverse lock. You would think if you were doing repeating drilling you could simply traverse the bit to the correct position and drill a hole and repeat the process. Wrong! there is now so much deflection in the Cross Head Tee that the drill bit again deflects upon contact with the material. The Head Traverse Lock must be engaged at every drill operation. This is where the RAD comes into play in its design to drill out to 420mm. The Table assembly. The table also has the ability to raise and lower it 700mm rotate it 360 degs or swing it out of the way completely and use the base. As to why you would alter the table angle as opposed to the head angle is not known but the feature is there ! Power switch located at the front and has NVR feature. Guards by virtue of its operation the guards fitted are adequate for the job. The belts are all enclosed and there is a flip up Perspex chuck guard fitted to the chuck. This guard would have to be removed when using a hole saws or similar tool larger then 3” or 70 mm. The cast iron Table is ground to a very smooth finish making preservation and cleaning easy. All other parts are painted. As it had a key chuck I added a magnet to hold the key at the side. Added a pull chain to the base to manoeuvre it about. I had the Head Angle locking pin remanufactured to enable unlocked traverse drilling but it was unsuccessful due to other existing manufacturing tolerances. Ease of operation: Complex! Requires meticulous checking when doing repeat work. The RAD is effectively a four axis drill and requires four times the amount of setting up to drill a hole. You would think you could drill with the Traverse lock disengaged for simplicity but its just not the case. Poor engineering tolerances cumulating in unacceptable errors if all components are not securely locked and checked before commencing work. The plastic crank handle on the table, this item is positioned right where one would attempt to hold the drill whilst moving it if portable, or risk breaking by impact or normal use. The 1/2 Hp motor is a limitation. Other: Requires bolting in place or the fitment of an aftermarket extended foot print to prevent toppling at max extensions. Value for money: At approx $400 and if you are needing all the additional features and prepared to spend the time setting it up it’s definitely a good buy, otherwise stick with a conventional drill press. Possibly the reason why there is not many machines in this price range available. I have a similar one by shop fox. you will find out that you will rarely use the tilting head and if you do the markings are accurate. 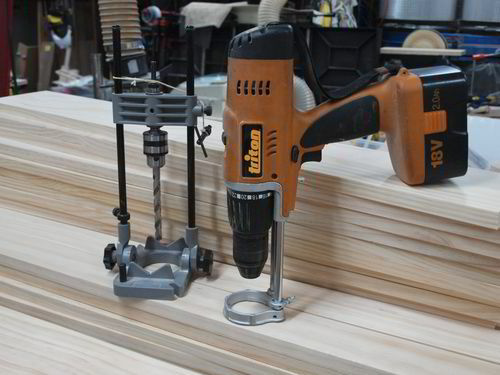 KILL THE PORTABILITY of your floor mount drill. YOU MUST ANCHOR IT TO THE FLOOR OR YOU OR SOMEBODY YOU LOVE CAN BE INJURED OR KILLED. These things weigh enough to cause serious damage. Find a spot and mount it. These type of drills were not designed to be portable and the foot of the drill is too small for just having it stand. it is designed to be mounted to the floor. I CANNOT STRESS ENOUGH that you MOUNT THIS TO THE FLOOR. after you mount it to the floor give it a trial and I am sure you will love it. the motors in these type of units made for woodworking can sometimes be a bit under powered when using larger bits such as 1 inch etc. these are not expensive commercial machine shop tools and there is a difference. I remember the one in high school, 47 years ago, was stronger then one of these. ha ha. 47 years. wow. and to think I did not care for wood shop bach then. I don’t have a drill press yet, and was always curious about the radial arm drill presses. Thanks for all the info, and great write-up BTW! I will want my drill press to be movable in my shop, so I guess the radial arm version is a no-go for me. I had a $80 Ryobi drill press for about 5 years. Used the crap outta that thing and sold it for $80 bucks. I was pretty happy with that drill press. 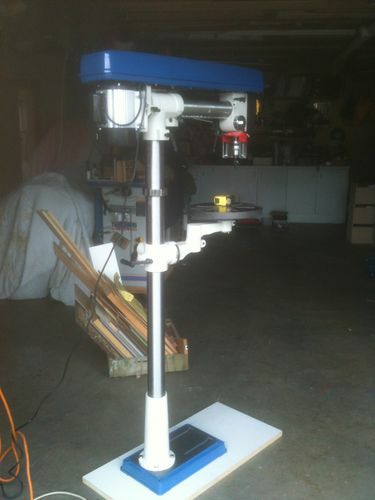 Wow, a radial arm drill press! Who knew such a thing existed? This is news to me. I think next I’m going to invent the radial arm lathe. Just because. Its good to see the effort in preparing reviews is read by viewers other than the Author !! Moron: What did you do to tweek your RAD? All my efforts in replacing the key and shiming the locking pin did not remove the “unlocked” play. I understand your concerns as to having it/or being mobile however the situation I have is that the drill is “parked up” next to th fridge and moved to a working position when in use. It is tall and heavy and a high risk of toppling if used without being aware of the risks. I have only seen metal engineering versions of these and they are definately of a size of where do yo want it as I am only moving it once! BTW I added the picture You found on ebay. Have a look at the video Bert posted in the comments it provides a very warts and all view of the machine at work and the concerns as raised by DAC. Ha ha the original drill press will stay as its a wood working heirloom possibly one of the earliest machines I ever bought. I know the dark green AEG drill I originall had in it whoud have been over 30 years old I literally wore it out, I was so impressed with it I tried to rebuild it but all the parts were not available bearings yes, field coils yes, mechanical gearbox parts yes, but sadly armature no. So I dismantled it and buried various parts around the garden in respect!! BTW An unusual LJ name… I hope it was not generated from a physical experience! There is possibly a Radial Arm Lathe out there just a small market, much the same as the RAD eh! Bert, The ebay model looks exactly the same mechanically as mine, only difference is what looks like a different paint job and obviously the branding. Not surprising this day and age, no doubt all originate from the PRC. I had a Delta bench top version many years ago. My main gripe was that there was no crank to raise and lower the table. Had to loosen the clamp and then wiggle the table to make it move. Not so bad gong down, but no fun at all raising it. I would not advise a radial drill press for drilling metal. Metal requires a lot more pressure, and there is too much flex in the various components for this. Maybe okay for small holes in aluminum. Thank you for a fantastically well written review. It is only $299.00 on E-Bay! Mine was $400 now $499 and personally considering the use I have had since purchase from the additional functionality, you are better off sticking to a conventional drill. Looks identical apart from a different paint job. Hope you got at least 1 free screw out of Carba-Tec for your effort. ... was $400… considering the use I have had… sticking to a conventional drill. BTW.. I owe you a big tongue kiss… I have been searching high and low for a missing drill bit that I just found in the chuck of the drill mate (pulled out of it’s resting place just for this reply).